Beachcombers Cottage Bright and inviting entry way with a place to rest and remove your shoes. Spacious living room with gas fireplace, flat screen TV and queen fold out couch for extra sleeping. Another view of the living room which shows the sliding glass door to the beautiful sunlight back deck. Great place to barbecue. Cozy fireplace for those chilly mornings or nights. We love the shell coffee table View from living room into dining room and kitchen. All open for easy entertaining. Large windows in the living room give you a view of the beautiful trees. Feels as if you are in the mountains yet you are just minutes from the beach. Spacious fully stocked kitchen with skylight up above for added light. Kitchen has electric stove, Ninja blender, flat griddle and much more What a big sand dollar Can you find one on the beach this big Main floor bathroom with tub and shower. Luxurious bedroom 1 with King bed and access to the outside deck. There is a flat screen TV too. Another view of king bedroom with TV. Back deck with gas BBQ, table and chairs. View of trees. Downstairs TV room with comfortable queen fold out futon. Great place to play board games and build puzzles. All the windows and sunlight allow for a great reading space too. View from other side of TV Room. There is a queen bedroom just off the TV room and the 3rd bedroom is down the hall. Bedroom 2 with Queen downstairs just off the TV room. Spacious, great linens and lots of closet space. Another view of the Queen room. Bedroom 3 with queen bed. Another view of bedroom 3 Washer and Dryer with lots of beach towels Downstairs full bathroom with shower, no tub. Manzanita Beach is less then 10 minutes from the house. Town is about the same. Enjoy your time in Manzanita at this beautifully decorated three bedroom, two bath home located six short blocks to beach and three to town. Nestled among mature trees, Beachcombers Cottage is located on the north side of Manzanita. The natural light from the large windows and skylights welcomes you into this modern, beautifully decorated home. The main floor has a spacious living room with beautiful furnishings, gas fireplace, flat screen TV, surround sound, and much more. The living room is open to the dining area that features a large table that seats ten. The kitchen is spacious and the owners have spared no expense in stocking it with everything you will need to prepare your favorite meals. On the same floor is a full bath with tub/shower. Close by is one of three bedrooms. This bedroom has a king bed with high end linens, lots of pillows, and a flat screen TV as a bonus. Downstairs you will find two more good size queen bedrooms with top quality mattresses and linens. Down the hall is another full bathroom with walk in shower only, no tub. The TV room downstairs has a very comfortable full size futon which can be folded out to make another sleeping space. The cabinet in the room holds a large flat screen TV and many games and puzzles for the whole family. All TV's have a DVD Player as well. Each room in this home is very inviting and comfortably furnished. Beachcombers Cottage provides WiFi. No pets are allowed in this home. Beachcombers sleeps ten (six to eight adult max please) and has a ten occupancy limit. 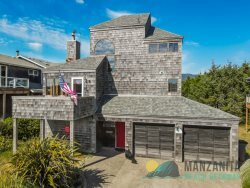 Once you stay and play at Beachcombers Cottage in Manzanita you will want to come back year after year!!! Well stocked kitchen with Ninja Blender, pancake griddle, crock pot and much more. Super clean and well organized. Lots of light. Well be back! Exceptionally friendly and accommodating staff. Thank you for helping us have a wonderful stay in manzanita! This property was light, bright and had all the amenities we needed for a fun girlfriend's weekend. Very prompt and courteous email communication. The cottage was absolutely perfect for our weekend getaway with friends. We loved the location, the decor, the kitchen, the beds (SOOO comfy) and the treehouse feel with the living room windows and patio. It was just perfect, and we look forward to returning! Everything was so easy- from the reservation to the check-in and check out. Really impressed with the Manzanita Beach Getaway team. Extremely clean and tastefully decorated. The total experience of renting a house in Manzanita has been made easy by this property management team. From securing the house, making payment, and moving in for our stay, all is very easy and convenient. The house having three bedrooms make it easy for several people to comfortably have their own space but to be able to be together when desired. I love looking out onto the forested area behind the house. It is like the outdoors comes right into the house. Each time our stay is very pleasant and enjoyable. Our only experience was the renting of the cottage via the internet. All good! Very accommodating and responsive! Everyone was wonderful and positive from booking to leaving. The housekeeping immediately ran back and brought us a high chair after we'd arrived and found there wasn't one there. Very friendly and kind. Very comfortable home, furnishings, decor, linens, mattreses and kitchen supplies are high quality like you'd find in your own home. Immaculately clean! We appreciated the short and simple directions for getting the house ready for check out. Everything was impeccable! We really enjoyed the house~Furnished beautifully, very clean, & beautiful view! Thank you! The MBGVR staff was friendly and responsive. The house was a pleasant place to be from the moment we arrived. The quality and abundance of the kitchen and bath amenities as well as the creative coastal decor greatly contributed to our comfort and enjoyment.